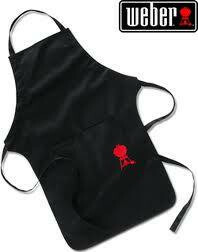 Webers Barbecue Black Apron keeps Barbecuing professional whilst stylish. Designed for men and women alike, the rounded corners and double hem stitching gives an overall sleek appearance. Webers Barbecue Black Apron keeps barbecuing professional whilst staying stylish. Designed for men and women alike, the rounded corners and double hem stitching gives an overall sleek appearance. Practical, this black cooking apron features Two Front Pockets for storing condiments and recipes for your ease of access, and has a High Neck to shield from any splatters of oil, together with an adjustable neck and waist fastenings for your comfort.